Anti-pollution teams are on standby after a massive ship carrying potentially dangerous chemicals beached one mile off the Devon coast. 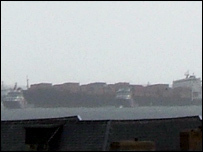 The MSC Napoli, which was holed in the English Channel on Thursday, is carrying 2,394 containers. About 150 contained "hazardous" substances including industrial and agricultural chemicals, the Maritime and Coastguard Agency (MCA) said. The ship has beached near Branscombe following serious structural failure. 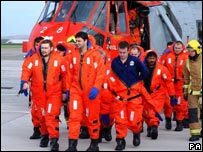 Its 26-man crew was rescued by helicopter on Thursday. With winds of up to gale force 9 predicted for Saturday, the MCA scrapped its original plan to take the ship to Portland Harbour in Dorset for salvage because of "serious danger of structural failure". Large cracks on both sides of the ship also worsened during the night. The MCA's Paul Coley told BBC News the ship's cargo - starting with potentially hazardous materials - would now be taken ashore from the ship's current position by salvage crews. The location was selected to "minimise the impact of any spillage" and to enable the salvage work, he said. "We made the decision it was better to keep the ship in one piece and to beach the ship and to commence the salvage operation by removing all the pollutants," he added. "The oils will be the first priority, the ships bunkers, fuel oil, and then the containers which are considered most hazardous first," he added. French news agencies reported this week that the vessel was carrying 1,700 tonnes of dangerous materials, including toxins. The MCA said the ship was being surrounded by a 1km boom to protect the sea from pollution. The ship has also been leaking its diesel fuel since Thursday which the MCA said had dispersed naturally and was not a pollution risk. The Department of Transport's Robin Middleton said he was "very confident" there would be no pollution from the cargo. "No dangerous chemicals are near the edge so it is very unlikely they will be swept overboard," he added. The 275m (900ft) Napoli, registered in London and owned by the Swiss Mediterranean Shipping Company, developed two long gashes on each side just above the water line in stormy weather on Thursday. With the engine room flooded and the vessel listing badly, the 26-man crew abandoned ship. Two helicopters from RNAS Culdrose airlifted all the crew in the French co-ordinated rescue. You can send us your pictures and video to: yourpics@bbc.co.uk or to send via MMS please dial +44 (0)7725 100 100.